The log is a useful facility to see what is going on. Many parts of Concrete5 and add-ons make entries in the log when significant events happen. Yet the standard log report is hidden away in the dashboard. Going to view the report takes time and when a lot is going on can push the entries you are interested in several pages down in the report. 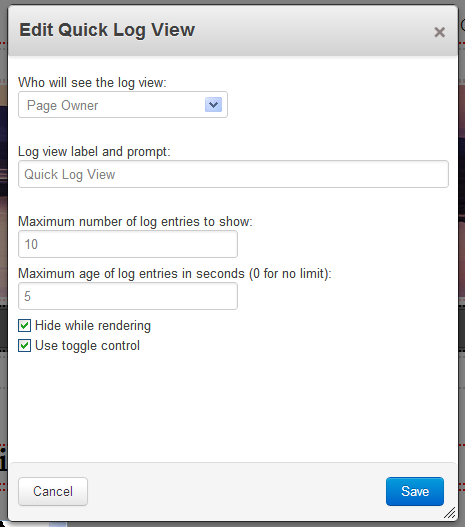 Add a Quick Log View block to place an icon directly on a page for selected users only. Simply click it to view recent entries. If you also have Blocks by AJAX, an included Blocks by AJAX template can be used to refresh the log view without having to refresh the page. See the documentation for detailed configuration. Get Quick Log View and other tools to take take the strain out of managing your site in the Lazy Webmaster bundle or Lazy Webmaster Plus bundle.